I love chicken almost as much as I love writing. To me, Roast Chicken, is like a mini-holiday all in of itself...minus all the annoying relatives popping over. However, there is a major sadness associated with this dish...a dry chicken. Not even the tastiest gravy can save poultry that’s been reduced to fleshy cardboard. Alas there are some poor souls out there that are destined to forever serve us chicken that tastes as if it’s been mummified for decades in the sands of the Sahara. Thus I have strived to come up with a recipe in which the top priority (outside of not killing you all from Salmonella) is to produce a moist, delicious bird with minimal effort that anyone can reproduce. 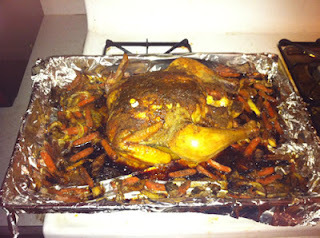 It should not only provide you with an excellent chicken, but it will also take into account the gravy and a side dish. Actual prep and work time: About 1/2 hour. First, you’ll want to make sure your bird is defrosted. This recipe is for chicken, not a block of ice. As for the size of the bird, it doesn’t matter. The only variant for this will be cooking time. Just to give you a baseline, the chicken in the pictures was about seven and a half pounds. It took three and a half hours to cook. Your mileage may vary. Step 1: Rub it on, baby! You’re going to create a dry rub for your chicken. This is going to serve the dual purpose of keeping moisture trapped inside, as well as giving it some awesome seasoning. You only need to make enough to cover the chicken, so don’t go nuts unless you plan on saving this rub for future cooking. 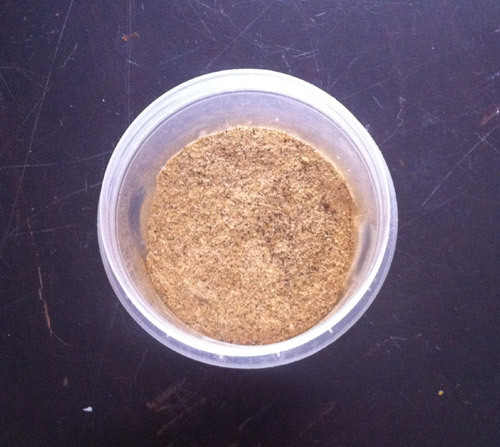 Any leftover rub can also be used (sparingly) to season the gravy or your vegetables. Feel free to vary the ingredients. Season it according to your own tastes / what you have handy. The only caveat here is that they should be dry mixes. 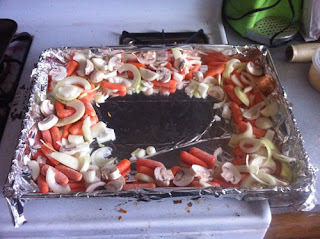 Fill the pan with vegetables of your choice, leaving enough room in the middle for your chicken. 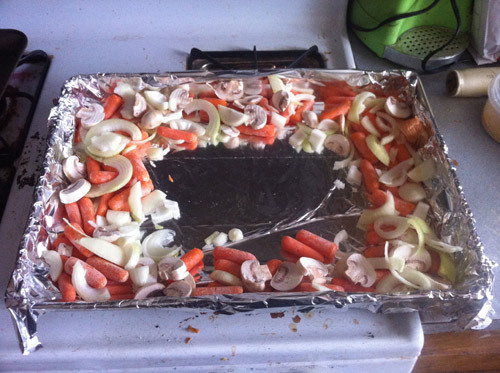 In the picture shown, I used carrots, mushrooms, and onions. Why? Because that’s all I had. However, you can feel free to use any you prefer for this. This will serve as a ready made side-dish for our chicken. Mix the vegetables up as you lay them down. This way they’ll not only absorb the chicken’s flavoring, but will season each other as well. Once you’re done, lightly season them. I prefer a pinch of salt and a light dusting of pepper. 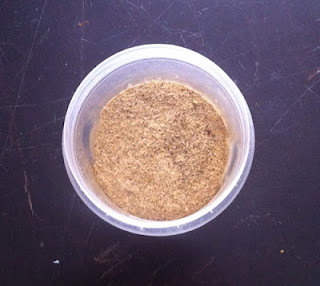 However, if you have any leftover rub from your chicken (see next section) you can also use that. Before you start this step, do one of two things: put on rubber gloves or wash your hands really well (before and after). It’s time to get all intimate with our chicken...no not THAT way, you perv! Jeez, some of you people are weird. Anyway, take the wrapping off of your defrosted chicken and rinse the bird quickly under some cold water. Remove the bag with the neck and the giblets from inside of the chicken. Open these up and put them into your gravy pot. Now it’s time to rub your chicken. First, you’re going to rub the bottom. Put the chicken on a plate, upside down, and go to town. You don’t need a thick coating, but you’ll want it to be even and covering the whole bird. 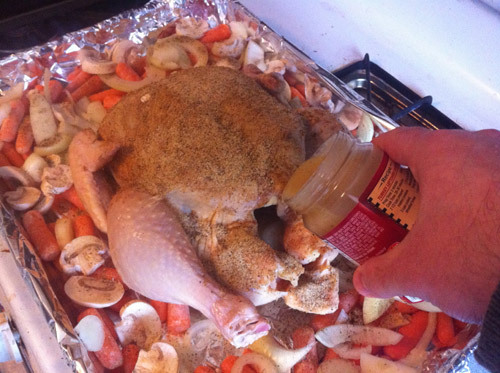 Pour some rub on the chicken and spread it around with your hands. 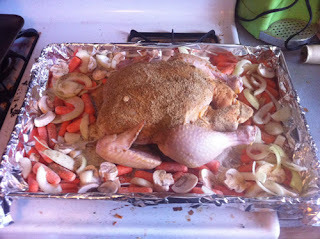 Once the bottom is finished, turn the chicken over and put it into the baking pan in that nice opening you left for it. Repeat the process for the top of the chicken. A quick note: you’ll notice in my picture that only the breast of the chicken is covered, the legs and wings are rub-free. That’s because my children are weird and refuse to eat what they call “spicy” chicken. Oh well, their loss. As long as you don’t have oddball offspring, cover all parts of the chicken with the rub. Start pre-heating your oven to 350 degrees. Get your jar of store gravy. Any will do. Seriously, even the cheap crap is fine. Hell, it doesn’t even need to be chicken gravy. You’ll notice I’m using turkey gravy. You could use beef or pork just as well too. Why? Because store bought gravies ALL taste the same...i.e. fairly nasty by themselves. Oh please! 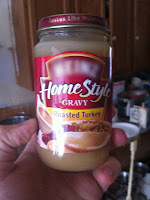 Don’t tell me you’re one of those people who will just dump a can of gravy into a pot, heat it up, and serve it as is. My god! What is wrong with you!? That’s it! Begone! Begone from my sight! Ok, now that we’ve gotten rid of them we can move on. 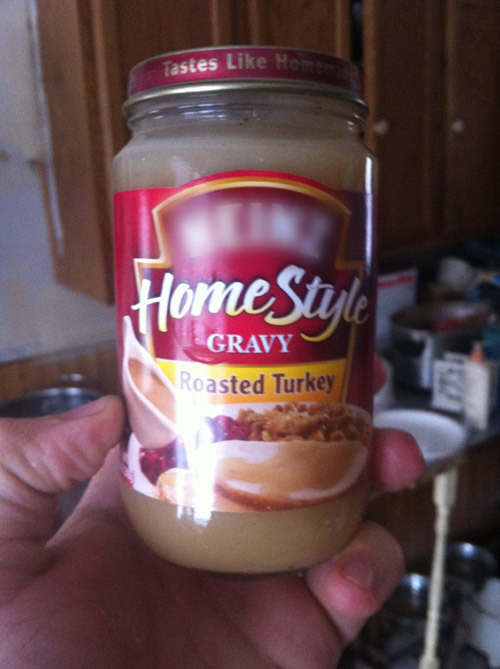 Store bought gravy by itself isn’t, well...gravy. What it is, however, is an excellent base with which to make some badass gravy. That’s what we’re going to do. Pour half of the jar inside of the chicken. Yes, I said inside of the chicken. See that big hole in your chicken? Fill it with gravy. This will serve a few purposes: First it will keep the inside of the chicken moist as it cooks. Secondly, it will absorb the flavor of your seasoned chicken. You are essentially cooking the gravy inside of the chicken. Thirdly, it will seep out as it cooks and further flavor your vegetables. Put the chicken into the oven. Time for that sucker to cook! Take the other half of the gravy and pour it into your sauce pot with the giblets. Fill the gravy can about halfway with water and add it to the pot. Turn on the stove to a medium heat. Bring this to a boil and reduce. This will cook your giblets and add their flavor to the gravy. Stir and mix in some spices (salt, pepper, onion powder etc). If you have any rub left over, you can also use that to help season the gravy. Boil it down for about ten minutes, then shut off the heat and leave it. We’ll get back to it later when our Chicken is finished. This is the easy part (at least for the next two hours). Set a timer and let the chicken cook for an hour. When time is up, open your oven and see how things are going. This step is important because not all chickens are created equally. Some birds are nice and juicy from the get go. The second you put them into the oven, their juices will come rushing out like you just popped a water balloon. Others...not so much. You’re going to gauge what type of bird yours is. That will determine what you do next. If the gravy inside of your bird is boiling and the bottom of your pan is filling up with liquidy chicken goodness, then you’re going to grab your turkey baster. You’re going to use some to baste the chicken. Just wet the top and sides. Then use some to baste the vegetables. The rest you’re going to add to your gravy pot. If the bottom of your pan is dry, that’s ok. 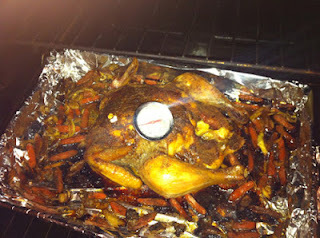 Stick the turkey baster into the chicken, where the gravy should be cooking, and grab just enough to baste the chicken. Leave the rest. Here’s where that optional can of chicken stock will come in. Open it up and use it to lightly baste your vegetables. That’s it, shouldn’t be more than just a light sprinkle. Whichever of the above you did, that’s fine. You’re done for now. Close the oven and go find something to occupy yourself for another hour. At hour two, repeat the above steps (depending on how things look now). By now your chicken will be turning a nice golden color and should smell heavenly. If you have any excess drippings and/or canned stock after this, add it to your gravy pot. Step 6: Stick a fork in it, literally. It’s done! Around hour two and a half, you’re going to want to check on your chicken more diligently...at least once every twenty minutes. Despite all of the above, if you overcook the crap out of your chicken, it will still be dry. This is a recipe for chicken, not miracles! Start using your meat thermometer. Forget what you learned growing up. A Temperature of 180 or higher will result in bland, dry chicken. 165 is considered safe for eating. If you’re paranoid, you can cook the chicken to 170. That’s fine too, and it should still be moist. 170 is your magic number. Once the chicken reaches that, turn off the oven and take it out immediately. Conversely, your chicken may have one of those little pop-up thermometers in it. Name brand chickens like, Perdue, come with them. Years ago, when they first came out, they sucked. Using them was a good way to ensure you were eating raw chicken. These days, however, they’re pretty good. The one in my chicken popped up just when the chicken was between 165 and 170...in other words, it worked perfectly. If your thermometer says the chicken is cooked and the thingee has popped up...you’re good. Trust me! I’m not trying to poison you here. We’ll save that for a future post (kidding!). The chicken is finished and the veggies surrounding it should be nicely cooked as well. Don’t believe me? Grab a carrot from the pan (yes it will be hot). Eat it! Yeah, it was pretty damn good wasn’t it? Regardless of how you cooked your bird (adding stock or not) there should be some left over liquid in your pan (and maybe your bird). Tilt it (a bit), so it all pools to one side and add all of this excess liquid to the gravy pot. Turn the stove to a medium heat and once again bring your gravy to a boil. Boil it down to a...well...a gravy-like consistency, stirring constantly so it doesn’t burn. If you’ve followed these directions you should wind up with gravy that’s flavorful as well as non-fatty / oily. There you have it. You now have a cooked chicken, a wonderful side dish, and awesome gravy to go with it. Why are you still reading this!? Go and eat it! Sorry to say, but there’s no after-shot of this chicken following dinner. Why? Because it looked like the carcass had been attacked by fire ants, that’s why! Good luck to you! May moist chicken bless your future endeavors. If you tried this recipe and liked it, please let me know. If you're only cooking for yourself (or you don't like carving), you can do really nice roast chicken with a single portion - I like a thigh or a couple of drumsticks, because they stay moister than a breast fillet. Season it and all, and then drumsticks take about twenty minutes, thighs a little longer. Cut into them to make saure they're not pink in the middle, and enjoy! Agreed. Drumsticks and wings cook up well and quickly too. I'll pass, but only because I've been a vegetarian for 18 years. Still steep but better than full price. This is the one area where I think Amazon beats Apple. My kids just recently smashed a kindle 3rd gen and, much to my surprise, Amazon was just like "These things happen. We'll send you out a new one tomorrow." Totally blew me away.